Access control systems equipment are designed and installed to manage who goes where in a building. Whether it’s an educational, retail, commercial or office environment, SGS will design access control systems to match your door entry demands. From the simple to the sophisticated; SGS offers the very latest access control technology, including Biometrics (finger print recognition) and Iris (eye scanning). 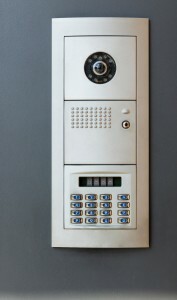 SGS also offers a large range of audio and video door entry systems. These may range from a single handset to well over 100 units in large residential projects – ‘see before you open’. Systems can be as simple as a single-door to fully ‘networked’ systems that may be linked across the customer’s own computer networks. This also enables ‘remote’ buildings to be linked to the system using modem links. SGS are experts in access control design including compliance with the new disability discrimination laws. Since 1st October 2004, the Disability Discrimination Act (DDA) has required businesses and organisations to take reasonable steps to tackle physical features that act as a barrier to disabled people to access services. How Do Access Control Systems Operate? Our access control systems can include automatic door operating equipment, automatic garage door and automatic gate opening systems. These can be operated by a wireless remote fob or long range proximity ‘token’. Access control cards can be printed on, allowing them to also be used as photographic ID cards. These can be designed in your corporate colours and can include a customised lanyard. SGS can offer all the leading systems such as PAC, Paxton, Bewator, Videx and Fermax. Most systems can be interfaced to CCTV, fire and intruder alarm systems, to maximise safety and security. Take the inconvenience and worry out of your home or business security by calling us on 01902 700687 today.